Lady Nelson was launched in England in 1798, and arrived in Sydney in 1800. 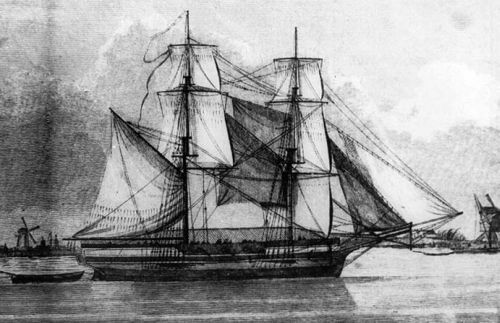 She helped transport Bowen's party to Risdon in 1803, charted the Tamar in 1804, and later that year helped carry Collins' party from Port Phillip to the Derwent. She continued to sail between Tasmania and New South Wales, Macquarie calling her the best and safest boat he had ever sailed in. Helping to establish the first settlement in northern Australia in 1824, in search of supplies the following year she was captured and burned, and her crew murdered, in Indonesia. In 1986 a full-sized replica of the Lady Nelson was built in Tasmania. Sailed by volunteers, she has taken part in training, education and tourist ventures, and in 1998 the Tall Ships Race from Sydney to Hobart. In 2003–04 she took part in bicentennial activities. Further reading: I Schaffer & G Roberts, Lady Nelson's voyage to the River Derwent, Hobart, 2003.